SEATTLE (AP) — Washington state and the city of Seattle on Thursday joined more than two dozen other government entities across the country suing to hold opioid makers accountable for an addiction crisis that has claimed thousands of lives. The governments hope to recoup costs of responding to drug addiction, including money spent on emergencies, criminal justice and social services. “Unlike earthquakes and hurricanes, this disaster is a human-made crisis,” Seattle City Attorney Pete Holmes told a news conference at Harborview Medical Center, where officials said more than 100 people were being treated for addiction. The latest suits, filed separately in King County Superior Court, accuse the companies of deliberately overstating the effectiveness of their prescription painkillers while misleading patients and doctors about the risks of addiction — in violation of Washington’s consumer protection laws. The state’s complaint names Purdue Pharma, the maker of OxyContin, while the city names numerous defendants, including Purdue, Teva Pharmaceutical and Teva Pharmaceutical. More than two dozen states, cities and counties — including Ohio, Mississippi, Orange County in California, and the Washington cities of Everett and Tacoma — have sued the pharmaceutical companies. Most other states have recently broadened a joint effort to investigate the companies’ actions. If the industry cooperates, the investigation could lead to a national settlement. Connecticut Attorney George Jepsen has said there are early indications that drug makers and distributors will discuss the matter with the states. 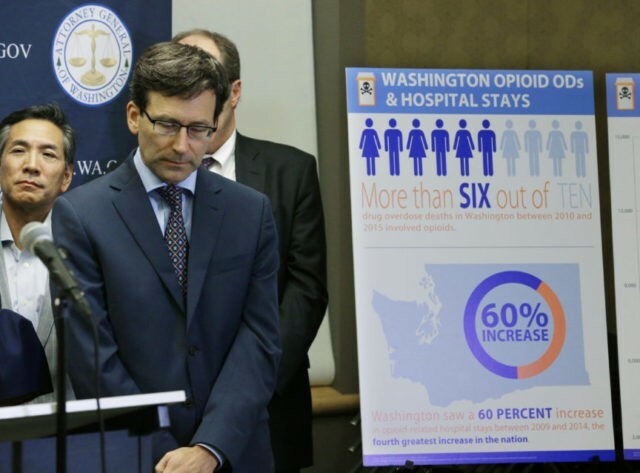 Washington state Attorney General Bob Ferguson said he was withdrawing from that effort because he was ready to sue now in light of the ongoing harms opioid addiction is causing in the state. Nearly 10,000 people have died from overdoses in the state since 2000, he said. “Purdue Pharma has knowingly conducted an uncontrolled experiment on the people of Washington state and the American public without any reliable, clinical evidence that opioids are safe or even effective at treating long-term, chronic pain,” he said. Ferguson and Holmes were joined at the news conference by representatives of the Seattle police and fire departments, as well as Rose Dennis, of Kirkland, who said her son became addicted as a 12-year-old when he spent nine months hooked to an opioid drip while being treated for leukemia at a Seattle medical center. He’s now 31, and has struggled since his teens with addiction and homelessness.